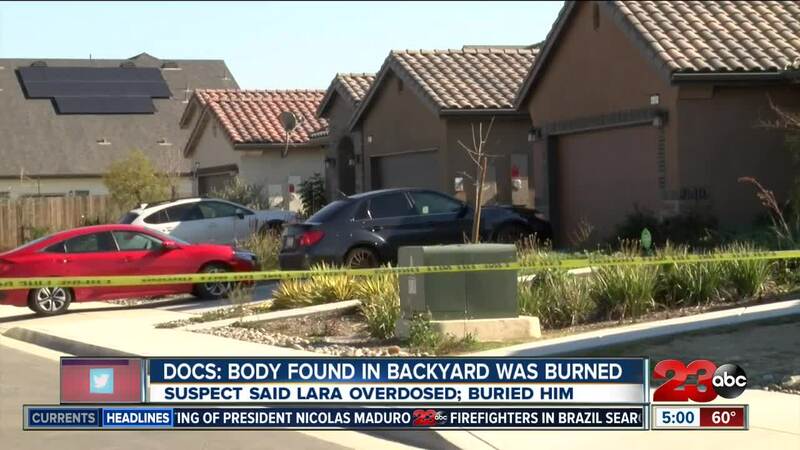 BAKERSFIELD, Calif. — We are learning more about the man arrested in connection to a body that was found in a backyard in Southwest Bakersfield, and who was charged by the Kern County District Attorney's Office Friday. Dennis Marroquin, 25 has entered a not guilty plea on all counts. He is scheduled to be in court for this case on February 6. Marroquin, was charged with one felony count of accessory and one felony count of conspire to commit a crime. He is due in court on those charges Friday. On Wednesday morning, Bakersfield Police were called to a home in the 6200 block of Hathaway Avenue, after someone reported a human toe was found in their backyard. According to new court documents released Friday, Marroquin told police that the victim, identified by family as 21-year-old Joseph Lara, had died of a drug overdose sometime in the past week at a different residence. Marroquin admitted he and another person transported Lara's body to the address on Hathaway, where they burned and buried the body in the backyard, according to court documents. The Kern County Coroner has confirmed that the body found at Hathaway Avenue, was identified as Lara. His cause and manner of death are pending further studies. Court documents also said that Marroquin was identified as a brother to one of the residents at the Hathaway home. On Wednesday, BPD said they found the man's body buried in the yard, and arrested Marroquin Wednesday night. Marroquin had previously been arrested in December on drug charges and charges of concealing evidence. According to KCSO, they have confirmed that the missing person's case is now closed and that they are no longer involved in the case. The investigation is now strictly under BPD.